* This is my second article for the new Jakarta-based magazine, January 2015 issue. My first article published in the maiden issue December 2014 was entitled, Is the PH power supply ready for the AEC? 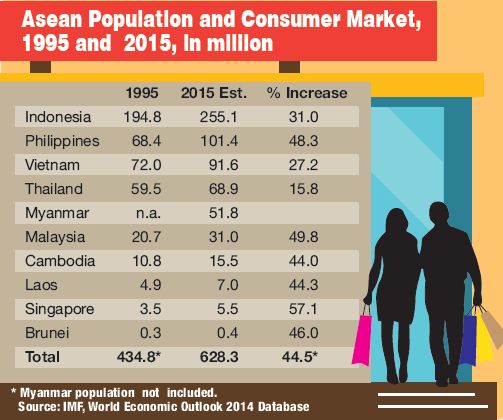 Southeast Asia’s economy is largely driven by rising household consumption, and one industry that thrives on this consumption like no other is food and beverages, fueled by rising personal incomes and increased spending. Consequently, this is also an industry where local companies have been particularly ambitious, with several evolving into successful global exporters. On the other hand, numerous foreign companies based outside Asean have also positioned themselves inside one or more of the 10 member countries, in a region with the third largest population on the planet, next to China and India. The large population with consumption of close to US$2 trillion is one of the largest strengths of the region—offering more people, more producers and consumers, more entrepreneurs and workers, along with low dependency ratio, since the population is generally young. Among companies located in the Philippines,at least six have already been listed among the largest transnational companies with existing branches and subsidiaries, or as having expansion plans in Asean. Jollibee Foods Corporation (JFC) is a perfect example, as it operates the largest fast food chain in the Philippines. As of end-September 2014—what started as an ice cream parlor in 1975—has grown to become a business with 2,121 food shops throughout the country. Its flagship and most popular chain store is Jollibee, with 800 stores nationwide, as of October 2013. It is owned by billionaire Tony Tan Caktiong. Other JFC food shops, each with dozens of branches, are Chowking (noodles, etc), Greenwich (pizza), Red Ribbon (cakes, 250 plus stores), and Mang Inasal (chicken with unlimited rice). JFC also holds the Philippine franchise for Burger King. Further, JFC owns more than 100 stores internationally, with a presence in the US, Middle East, China and Hong Kong. 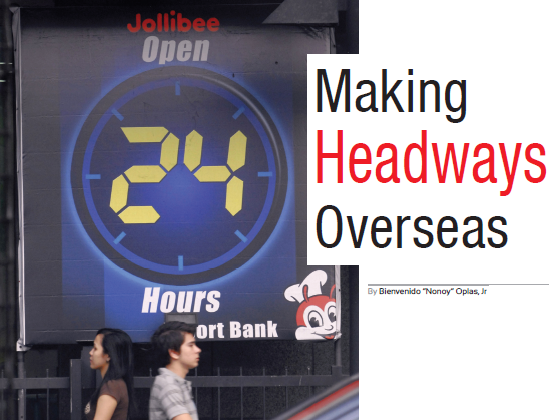 Though it has yet to enter Canada and Europe, within the region Jollibee has branches in Singapore, Vietnam and Brunei Darussalam. In Singapore, JFC has a wholly-owned subsidiary, Golden Plate Pte Ltd, which entered into an agreement with Beeworks Inc to own and operate Jollibee stores there. GPPL will own 60% and Beeworks will hold the remaining 40% stake in the company, with an initial funding of US$1 million. JFC has 32 stores in Vietnam and 11 in Brunei, as well. Now the company is set to enter Malaysia and return to Indonesia, in the absence of a local fast food firm available for acquisition. Its reopening in Indonesia after the Asian financial crisis in the late 1990s is largely encouraged by a very tempting market, given its large population and rapidly growing middle class. JFC’s plan, however, is not to expand into the neighboring country alone, but to have a local partner, according to the interaksyon.com news portal. In November 2013, the company declared, “Among all Asians, restaurant companies including fast-food, Jollibee can be the biggest.” Also, JFC Chief Financial Officer Ysmael Baysa said the company could become Asia’s largest restaurant chain by 2020. JFC also has a 50% interest in joint ventures with Highlands Coffee (Vietnam, Philippines), Pho 24 (Vietnam, Indonesia, Philippinesand Japan) and Sabu (China). Also making it big in the food sector is the Max’s Group, which owns numerous restaurant brands, with its flagship and most famous being Max’s Restaurant. Its 13 other brands include Max’s Corner Bakery, Krispy Kreme (donuts), Jamba Juice, Pancake House, Dencio’s, Kabisera ng Dencio’s, Teriyaki Boy, Sizzlin’ Pepper Steak, Le Coeur De France, The Chicken Rice Shop, Singkit, Maple and Yellow Cab (pizza). Max’s Group President Robert Trota was quoted by interaksyon.com as saying that the company plans to open 12 locations in the US, Canada and the Middle East. In Asean, Pancake House has four stores in Malaysia, while in Brunei it recently opened its first store. “We’ve been looking at Indonesia, Singapore… We’re just assessing formats,” Trota said. Meanwhile, San Miguel Corporation (SMC) is known as one of the Philippines’ largest corporations, with its San Miguel beer flagship product. Currently, there are six San Miguel Breweries in Asia, one in Hong Kong, two in China (Guangdong and Baoding) and three within Asean (Vietnam, Thailand and Indonesia.). San Miguel started as a brewery during Spanish colonial times in 1890, but has diversified into packing, property, petrochemicals and power generation. However, San Miguel’s dominance in the food industry may soon be facing a serious challenge from Indonesia’s Salim Group, which through its Hong Kong-based conglomerate First Pacific Co Ltd, and in cooperation with Malaysia’s Wilmar International, acquired Australia’s Goodman Fielder for US$1.37 billion, according to an smh.com.au report. The transaction is expected to be completed in Q1-2015. Within the pharmaceutical and healthcare sector, a local generics manufacturer, United Laboratories (Unilab), has cornered about 25% of the market share in the Philippine pharma market and has out-performed all multinational pharma companies in the country. It also has a presence in all Asean countries, except Brunei, and will only expand its existing operations within the region. In Indonesia, Unilab’s leading over the counter brands are Decolgen and Neozep in the cough and cold category, the multi-vitamin Enervon C and Biogesic for headache relief. Apart from Unilab, there is also Zuellig Pharma, one of the largest multinational pharmaceutical distribution networks in Asia. It originated in the Philippines and its operations today cover all 10 Asean member countries. Pilmico completed its first flour shipment to Vietnam last December, and is also opening an office in Indonesia. Incorporated on Aug 8, 1958, Pilmico started out as a joint venture among the Aboitiz Group, Lu Do Group, Soriano Group and the US Pillsbury Group. At the end of the day, everything will look like a case of companies from other Asean countries entering the Philippines and Philippine companies entering other Asean economies. However, it must also be taken into account that the region is a complex and competitive market where success is defined not only by product quality or marketing efforts, but also by the ability to deliver product to consumers using an optimal distribution strategy. It is therefore essential for all food and drink brands, and investors looking at the Southeast Asian market, to also have a sound understanding of local distribution structures, coverage and commercial terms. Only then can an expansion drive be truly effective. Labels: ASEAN, ASEAN Voices, Jollibee, multinationals, San Miguel Corp.